If you want to speak to an expert instead of reading our web site, just call 805-375-7000. But please do read on; everything you want to know should be here, including prices. Who uses these pager systems? Our paging systems, while mostly sold to restaurants (thus our "FoodSoftware" name), are also perfectly at home in hospitals, clinics, salons, churches, meeting rooms, private homes and many other applications where a sure and silent call for attention must be made. 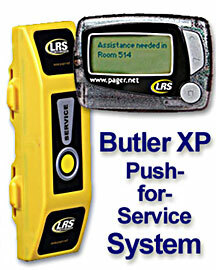 What's a push-for-service pager system? These are "local wireless pager systems" that take the place of ring-for-service bells, doorbells, buzzers and just plain running around and yelling to find the person you want. These systems have their own radio transmitters that broadcast directly to their pagers and don't need to use phone lines. The small push-for-service pager systems often only have one button simply marked, "Service" on the transmitter. Like pressing a doorbell, just push the button to set off the pager. 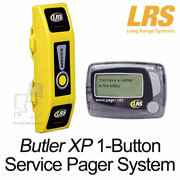 The pagers are usually silent but hard to ignore because they vibrate strongly. Systems are super easy to install- they're basically plug-and-play. They come complete with pagers and control transmitters (and chargers if needed). Number of buttons on the transmitter face: 1, 5 or 6. Indoor or outdoor use of the transmitter. Availability of ports for doorbell switches or door sensors. Ability to do "shadow" or "rollover" paging. Surfaces for mounting custom labels and button titles. Small size- about as big as a desk phone handset. User-replaceable batteries that last for months. Range of up to a quarter-mile (in open air but reduced in and around buildings). Ability to contact multiple pagers (if the pagers all have the same ID). Read on for details about particular transmitter models . . .
One large button on the face with a large variety of stickers for easy labeling. Wall screw or velcro mount. Six buttons with stickers for the face of the unit to label each button. One button on the face of the unit marked "Service". Variety of mounts including straps, wall plates and pole mounts (sold separately). Flat surfaces for custom graphic panels. Shadow paging- the ability to contact two pagers with different ID at the same time. 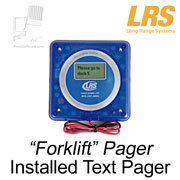 Auto Repaging and Rollover paging to assure response- the ability to repage if not answered, and if still not answered, page a different pager. 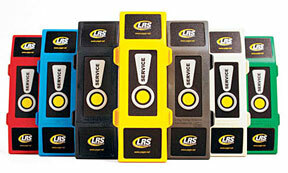 Staff pagers are for users who wear them for their entire shift, usually clipped to a belt. 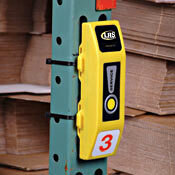 Staff pagers are small and usually just vibrate silently. This is enough in situations where there is only one transmitter and one button because there is only one message-"respond to the call". When you have more than one button or transmitter, each button may send different text messages- which station called, what service is needed, etc. 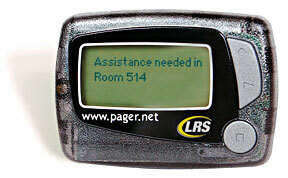 The staff pager has a text window to show the message. 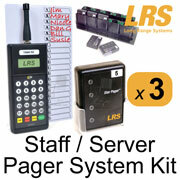 We have different types of staff pagers, but for small systems we usually include a "manager" or "alpha" pager. 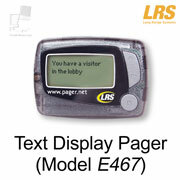 It is a small, traditional-looking pager with a text window and message memory. It has a user-replaceable battery that lasts for months. It does not require a charger system. This web site offers a few standard push-for-service systems (see below) with the main difference between them being the type of transmitter. But you can mix-and-match the transmitter and pager types and quantities to make any system you need. 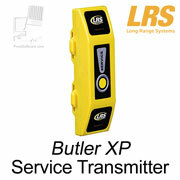 You can also add repeater transmitters to extend the range of the transmitters. To order custom systems, call 805-375-7000. 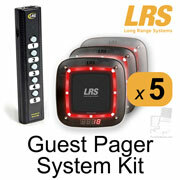 How Many Transmitters and Pagers Do You Need? Our standard push-for-service systems have one transmitter and pager. When you have more than page location (service desks, locked outside doors, exam rooms, restaurant tables), order transmitters for each. You can have many transmitters call one or more pagers and the pagers may say which location called. You can create different combinations of service buttons calling pagers. 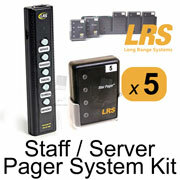 How Much Do Pager Systems Cost? Click the links below to see the current prices of our standard push-for-service and small staff system products. Prices are shown in the upper left corner of the product detail pages. Please call 805-375-7000 for prices on custom systems not listed or unusually large orders. Click on the links below for detailed information about our key restaurant software products. Ideal for poolside and beach service. Variety of mounting systems: secure wall plate, velcro, straps, pole. Programmable message and target pager. Auto repage with rollover paging to backup staff. Ghost paging to a second pager. One button, one or more pagers. Six buttons, one or more pagers. Button panels for a wide variety of button labels. Programmable messages and target pagers for each button. Five buttons, one or more pagers. Label panels for custom button labels. One switch port for connection to doorbell switches or door sensors. Programmable message and target pagers. Non-text pagers with charging system.